How many times can you reuse your brine for boiling peanuts? I have been selling boiled peanuts, and make fresh water daily when I sell them. Will the brine last for more than one day? Comments for How many times can you reuse your brine for boiling peanuts? You are asking 2 questions. The first question is how many times can brine be used for boiling peanuts. The second question is whether boiled peanut brine will last more than one day. 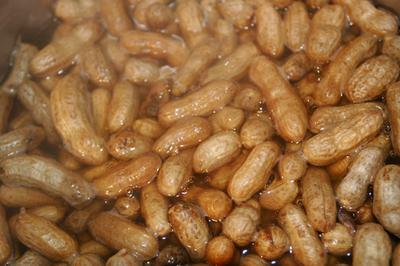 Brine used for boiling green peanuts can be used for up to three batches. This assumes the green peanuts were washed carefully, through 4 changes of water, prior to boiling. Green peanuts boil for at least 1 hour, up to 4 hours. If you are boiling dried peanuts, I would not use the same brine for more than one batch of peanuts, due to the long boiling time (up to 24 hours). Whether the boiled peanut brine is safe to use the next day depends on how you store the brine. It is important that foods be held at safe temperatures, either cold enough, or hot enough, to inhibit bacterial growth over time. The USDA says "Hot food should be held at 140°F or warmer. Cold food should be held at 40°F or colder". The dangerous range of temperatures for food holding is between 40°F, and 140°F. I often refrigerate boiled peanuts in their brine overnight, to saturate the peanuts with the salt flavor. In the following video, a Georgia peanut boiler, J.R. Odum, describes how his business cleans, and boils green peanuts commercially, (courtesy Georgia Peanut Commission, 1990). He says they use "three cookings per pot of water".